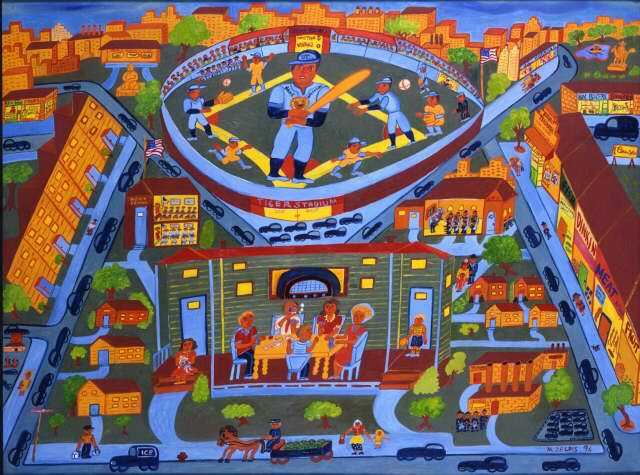 On my recent visit to the Fenimore Art Museum, there were many pieces that really hit with me but one that I keep coming back to in my mind is a folk art painting from Malcah Zeldis titled Homage to Hank Greenberg. 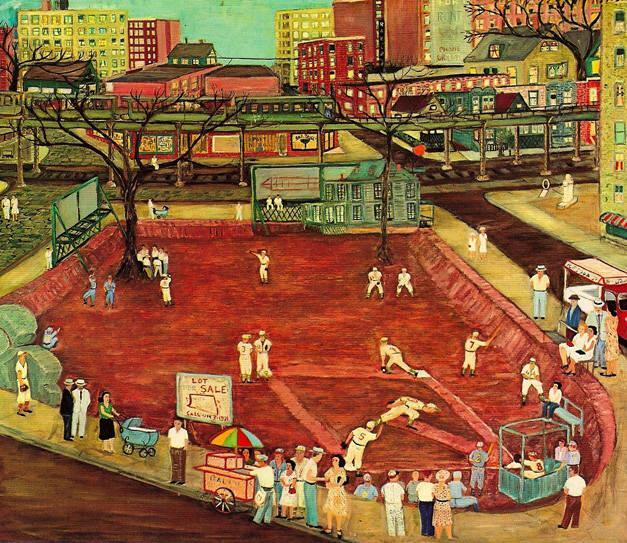 Greenberg, the large figure of the baseball player in the upper center of the painting, played for the Detroit Tigers in the 1930’s and 40’s and was a power-hitting superstar of that era. Known as the Hebrew Hammer, not only was he the hero of Detroit fans but he was also a hero to Jewish fans throughout the nation. Malcah, born in the Bronx but raised in Detroit, was a fan of Greenberg’s in both camps. He was to her, as the painting shows, larger than life. The painting has a wonderful glow to it in the museum gallery, a bit more warm and orange than this image, that makes it most appealing. This warmth draws you in and allows you to take in all the smaller details that Malcah has painted into the beautifully laid-out scene, such as scene directly below Greenberg where the artist and her family are portrayed sitting around the radio, listening to the game. 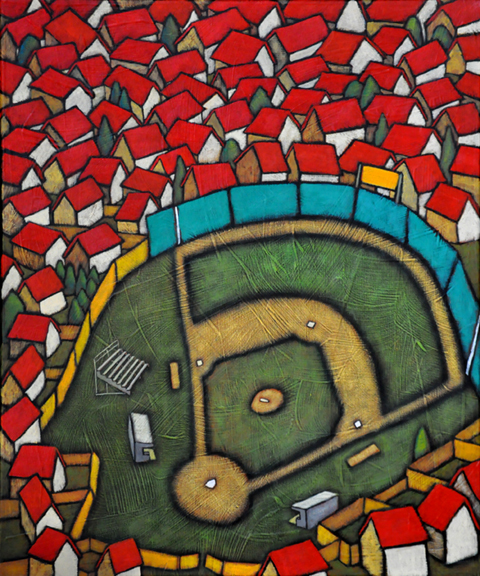 I also find appeal in this painting in that the work is so confident and sure handed in the way the paint is applied. It creates a real sense of solidness in the whole piece, giving you the sense that the artist is totally committed to their vision and their message. In short, I think it’s just a damn fine painting. For more info, on Malcah Zeldis, who is one interesting person, I refer you to a blogpost from the American Folk Art @ Cooperstown site and to an interesting article from earlier this year in the Downtown Express, the Newspaper of Lower Manhattan as they put it. She has led a vibrant and interesting life and still creates wonderful work at the age of 80. Here’s a video that shows her in her apartment talking about some of her paintings and other objects she has found.